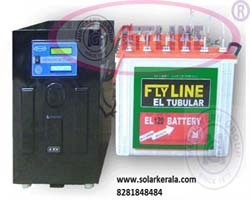 Muricken's Group is reknowned as one of the well reputed Flyline Solar UPS system in Kerala. It is fully automatic solar power conditioner capable of working both grid power as well as solar power ( hybrid system ). We have a 15 years experience in production and installation of solar inverter in Kerala.. You must need an advice from experienced technical support before installation, which will help you from unnecessary expenses and get complete solar power consumption. The products manufactured with super quality raw materials so as to assure our customers of our authenticity and reliability. Use of uninterrupted Solar power supply to save money. Normally the ON/OF switch is provided in the front panel. ► Flyline pure sine wave solar system is a solar charged automatic inverter that can be used for lighting up a house as well as powering computers and other electronic equipments that need uninterrupted power supply. ► Separate mains on off charger switch. ► Works with the power of solar power/AC power (KSEB line), the best way to save money and nation by using natural resource. ► Provision for connecting KSEB current and solar power. ► Attractive Designs. ► Pollution free type. ► Single Switch Operation. ► DSP based very low component cost design. ► Single sided PCB, easy to assemble without any SMD components. ► Auto resetting. ► Protection from lightening, high/Low Voltage Trip. ► Over Load Protection. ► Over Charge and Deep Discharge cut off. ► Independent Digital display for Solar or KSEB charging voltage, main voltage, inverter voltage,load etc. ► Solar charger LCD display-panel voltage , battery voltage, out current, solar in use, direct mains, saved unit - only 36 and above volt system. ► Audio and Visual Indicators. ► Can be connected to the existing wiring. ► Bridge type center aligned switching MOSFET based topology. ► No husking sound. ► It is a fully automatic built-in charging control system, no need of any manpower. ► The Special feature of the system is, when the battery is full and there is sufficient sunlight the system will automatically cut the main line off (KSEB Line) and connect the solar system. This feature is applicable only if you use the recommended capacity of solar panel and solar inverter. ► The main advantage of our built in solar charger is floating type and once it fully charges the battery, it gone to trickle charging. This will provide more battery life and can utilize 100 % efficiency of solar panel power. ► The first preference is for solar charging and when the battery is low and there is no sufficient sunlight, there is an option for manual or automatic grid charging through separate switch. ► ISO: 9001 -2015 Certified solar power conditioner. ► An ideal unit for part time power supply with low investment. System priority Stage : - solar-battery-grid 1) When solar energy is sufficient total out put load will operate on solar Inverter. Excess solar power will charge batteries. 2) When solar energy is weak then inverter will take DC source from batteries to compensate the out put load. 3) When the battery discharge level reaches 11.2 volt or below, the out put load is shifted to grid and the batteries are charged with the help of solar power only. 4) At Day time when each battery becomes 13.5 v the output load again shift to solar Inverter. 5) In 48 and above DC volt system of solar inverter - At night or when there is no sunlight the batteries reach 70% discharge level (30 % kept as a buffer) the out put load is shifted to grid without any change over time. (Each battery discharging level become 1.5 v ) 6) In 12 and 24 volt DC system of solar inverter - At night or when there is no sunlight, the out put load is shifted to grid and the battery back-up is used only when there is a grid failure. 7) After shifting the load to grid there is an optional on –off switch ( manual ) to charge the battery from grid up to 13.5 volt . 8) At night During changeover of load from battery backup to grid supply (i.e 70 % battery discharged) and if grid supply is absent then load is shifted to solar inverter to use buffer battery backup (i.e balance 30 %) 9) By using solar power the solar charger high cut-off is 14.5 V of each battery. Available in the range 650VA, 1000VA 1300VA, 2000VA 3000VA and 5000 VA and stand along system is up to 100 KVA. Price of the Solar inverter is depend up on quality ,capacity/power of inverter, capacity of battery, type and watts of solar panel we use. Over all cost is based on back-up of solar power we needed.